I’ll admit I typically push aside casseroles on the Thanksgiving buffet; I have faint memories from childhood of too much mush and mystery ingredients (no offense to my relatives! ), so I’d opt for recognizable veggies or potatoes instead. However, corn soufflé has always been the exception. The sweet and decadent dish is simple yet complex. 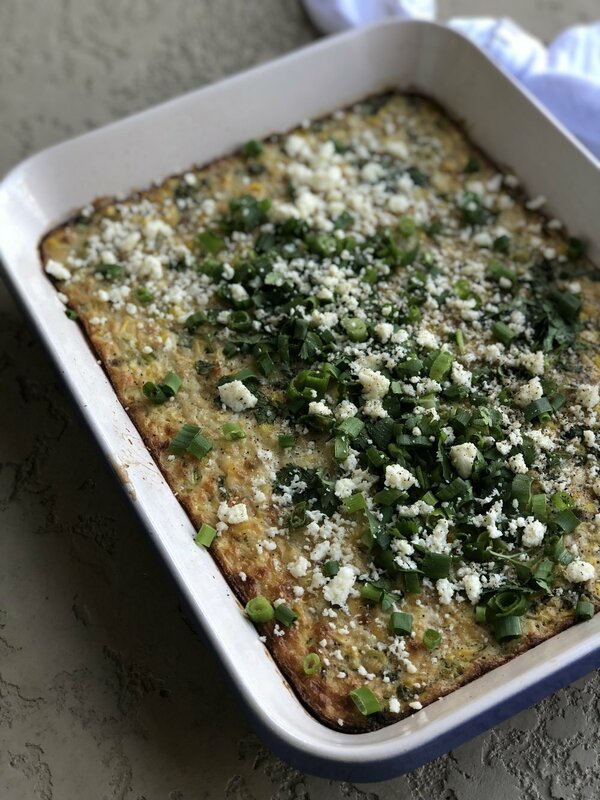 And this Mexican street corn version, namely due to the charred cooking method as well appearances by Cotija cheese and cilantro, is a playful and trendy take to traditional methods. I hope you enjoy this one! 1. Grease a 9x13 ceramic baking dish with cooking spray; set aside. Preheat broiler to high. 2. Finely chop white and light green parts, equaling approximately 1/3 cup. Reserve green tops for garnish. 3. Arrange corn on an aluminum-foil rimmed baking sheet. Spray corn with cooking spray and broil, turning once or twice, until lightly charred, about 15 minutes. Remove and allow to cool for 10 minutes. Turn oven to 350 degrees. 4. While corn is cooling, heat canola in a skillet over medium-high. Add garlic and white/light green scallions, cooking until fragrant, about 1 minute. Transfer to a large bowl. 5. Cut corn kernels from cobs and add to garlic and scallions. Stir in milk, eggs, and melted butter. Then, add flour, cilantro, salt and pepper. Carefully our into baking dish. 6. Bake until bubbly and golden brown, about 40 minutes. Let cool for 5 minutes. Slice reserved green scallions. Sprinkle atop soufflé alongside cotija cheese and chili powder. Squeeze with lime before serving.